Routines are so important to me. They help me put purpose into my days. The first thing I do each day is to seek God first. If I'm too busy to be with God, I'm too busy. God directs and establishes my steps. I always pray for wisdom to do everything I'm supposed to do in a day. I think that everyone has a routine. Some people put glitter on theirs and we all marvel at it. Even if your routine is to sleep until 1 p.m. each day, you still have a routine. Here's the thing: if you don't like the results of your current routine, get creative, make a doable plan and effectively follow it. • Creative - When we use our imagination, we are being creative. I had to change my cleaning routine when I started working. I came up with a creative idea that allowed me to keep the cleaning done, even with limited time. It's okay to borrow someone else's creative ideas. Just remember that for every problem, there is a creative solution. • Doable - don't be lured by complex concepts: find something doable to improve your routines. I heard an ultramarathoner say that he runs a marathon every day before breakfast. Someone like me can only run one of those per year, two if I'm really in shape. Doable for me means running 4 miles twice a week and following a half-marathon schedule on weekends. Do something that works for you and be consistent. • Effective - if you effectively follow your routine, you will get the results you want. One year I decided to add Bible reading to my morning routine. I got late with my reading and I didn't get the results I wanted. The following year, I effectively followed my reading plan and I reached the goal of reading the Bible in One Year. I encourage you to analyze your routines. If you like what you see, keep going. 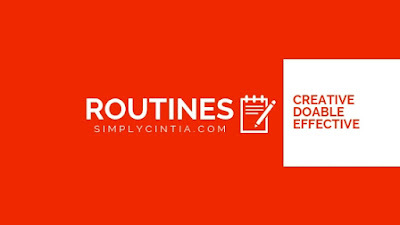 If your routine needs improvement, get creative, make a doable plan and effectively follow it.